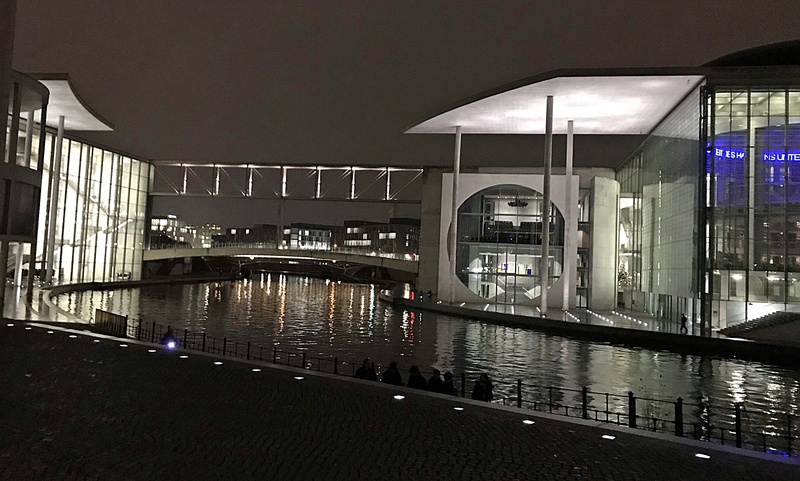 Last night I visited the German Bundestag and toured the Reichstag dome. I took the U-Bahn and then enjoyed the city lights during a misty walk along the canal. Reichstag security is tight with guards patrolling the building inside and out. You must register in advance and present your passport for identification. It’s a tedious drill and the frisking part isn’t pleasant, but it’s worth the experience. The Reichstag is in the Berlin Government District which has interesting buildings named after well-known parliamentarians like activist Marie Elisabeth Lüders. It’s near Brandenburg Gate where a small group of people gathered to pray, sing, and dance celebrating Hanukkah. Berlin constructed a temporary menorah in front of the Gate to honor the Jewish holidays. 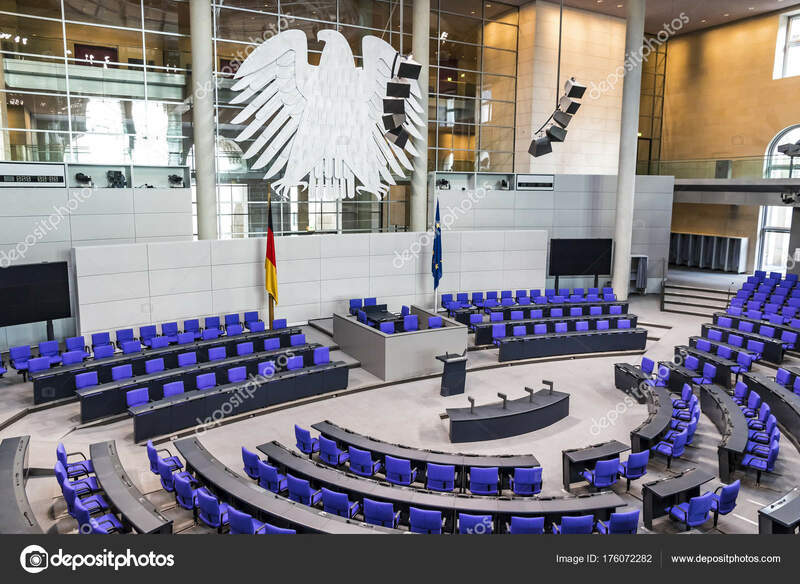 The Bundestag is the National Parliament and the legislative branch of the Federal Republic of Germany. 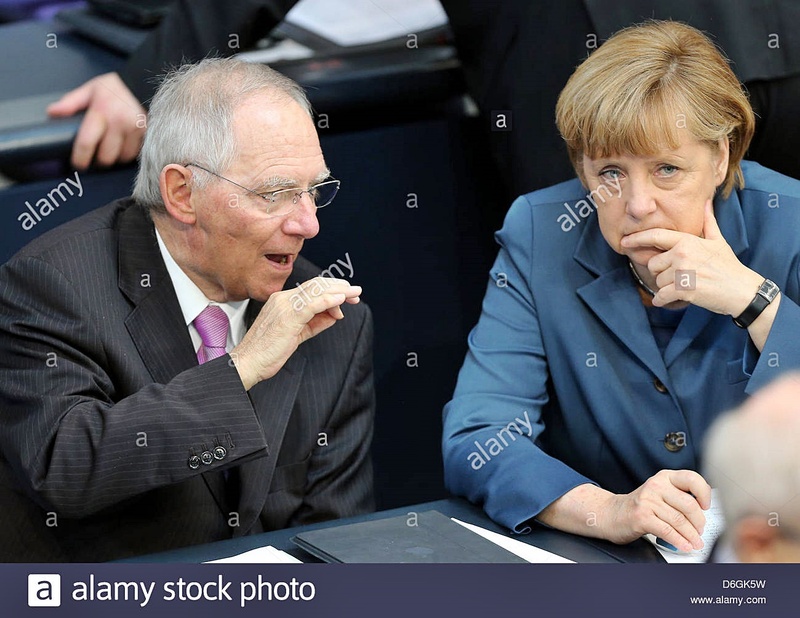 Since 2017, Wolfgang Schäuble is the President of the Federal Assembly and the Bundestag. He’s been a “member of the Bundestag since 1972 and is the longest-serving member of all German parliaments ever elected at national level”. 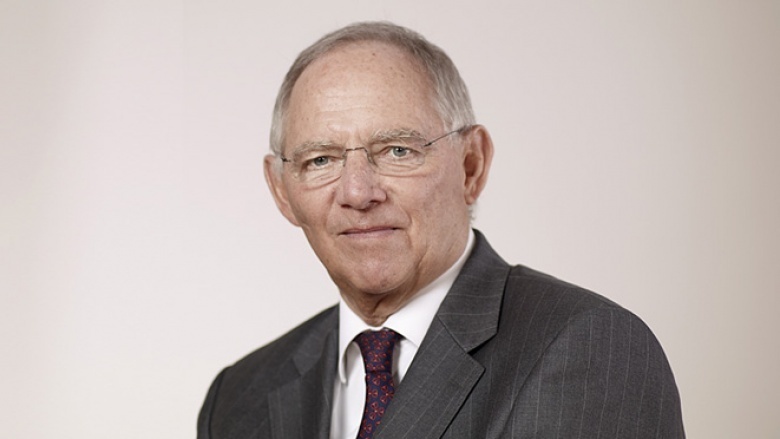 Dr. Schäuble was formerly Minister of the Interior and Finance and instrumental in negotiating the German Unification Treaty in 1990. 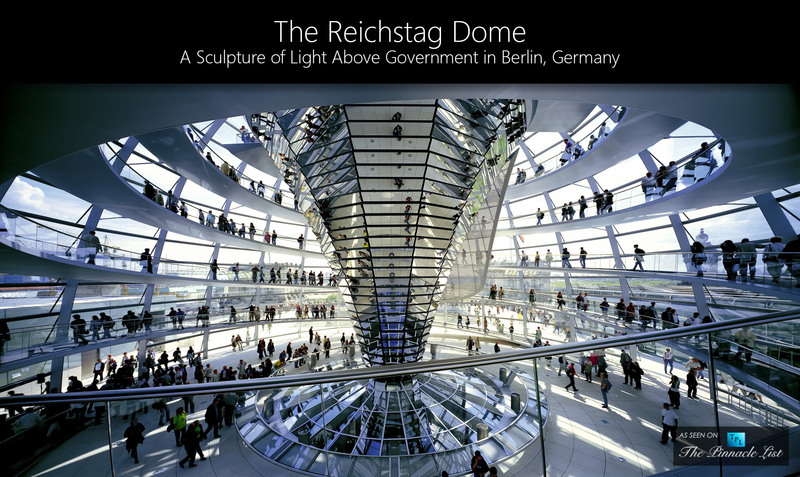 In the lobby at the base of the dome there’s a permanent exhibition with photos and narrative presenting a detailed historical account of the German Government. 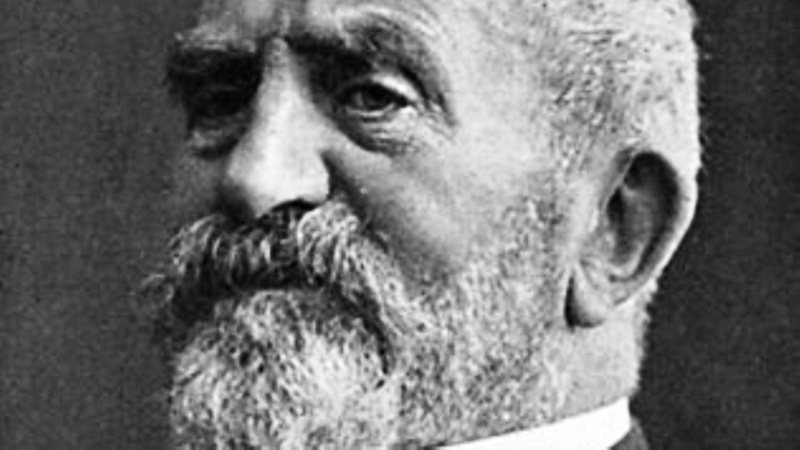 It covers ununited Germany to postwar unification, beginning with Charlemagne Holy Roman Emperor (742-814), and including the House of Habsburg (1618-1648), Weimar Republic (1919 to 1933), and Hitler’s Nazi Regime (1933 -1945). “Germans elect representatives by universal, direct, free, equal, and secret ballot in 299 constituencies.” Through election these representatives receive a mandate and are called MPs. The complicated system of “personalized proportional representation allows voters, on the one hand, to vote for the political party they prefer, and on the other hand, to vote independently for a candidate of their constituency”. Plenary Hall is “illuminated by a mirror system that diverts daylight from the dome into the Reichstag building”. In 1990 the Reichstag was the site of the official reunification ceremony. After restoration from 1995 -1999, it once again became the home of the German National Parliament. 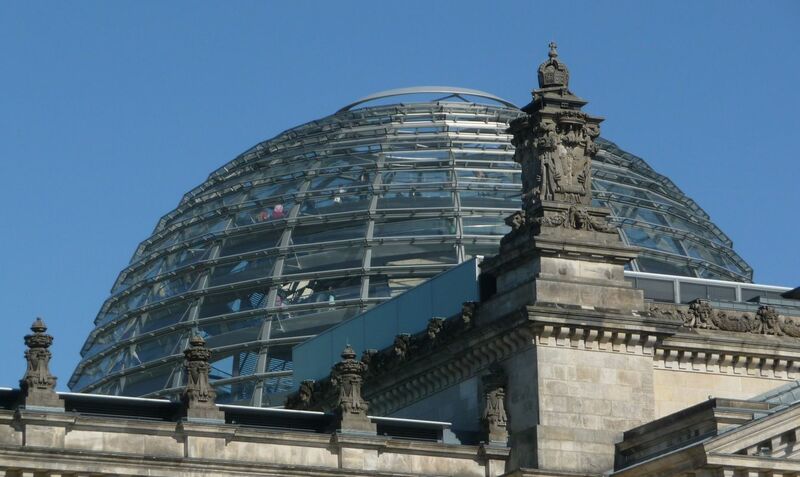 The glass dome was not part of the original plans for Reichstag renovation – but that’s a separate and interesting story. 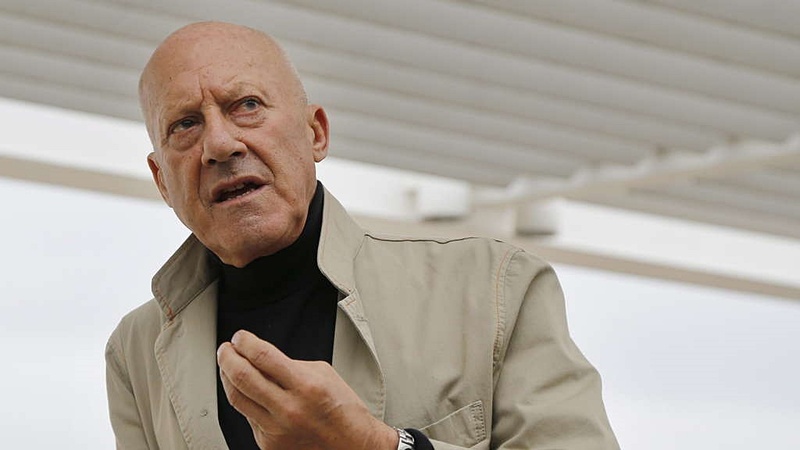 After the rebuild, British architect Norman Foster designed the glass dome to symbolize Germany’s reunification. There’s an incredible 360 degree view of Berlin from the top! 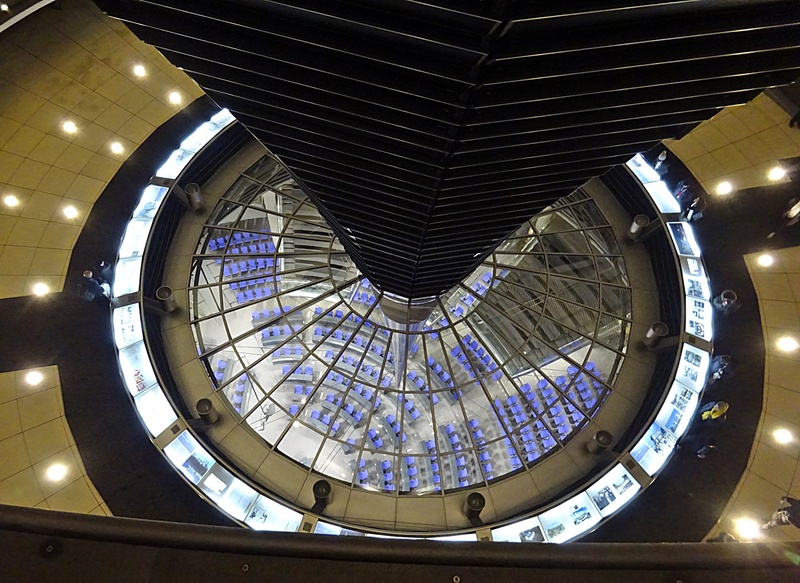 A mirrored cone in the center allows visitors to see the Reichstag’s Plenary Chamber below and watch government in process. You reach the top of the dome by climbing “two steel, spiraling ramps that are reminiscent of a double helix“. The Dome “symbolizes that the people are above the government, as was not the case during Nazism”. Foster designed the glass dome to be environmentally friendly. “Energy efficient features use daylight shining through the mirrored cone to decrease carbon emissions”. A large “sun shield tracks the movement of the sun electronically and blocks direct sunlight to prevent large solar gain from dazzling those below”. The futuristic and transparent design of the Reichstag Dome symbolizes Berlin’s attempt to move away from a past of Nazism toward a future with emphasis on a united, democratic Germany. 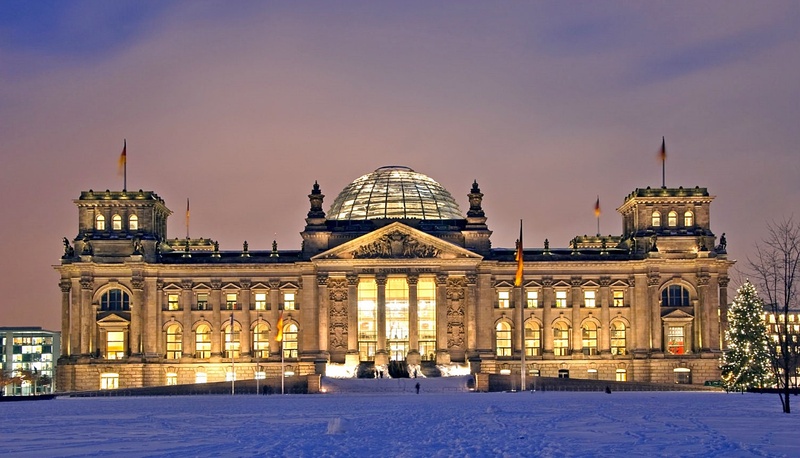 The original Reichstag was built in 1895 and designed by Frankfurt architect Paul Wallot. The building featured a large dome. In 1933, the Reichstag Fire destroyed the entire building. The Communists were blamed, but there was no conclusive evidence. 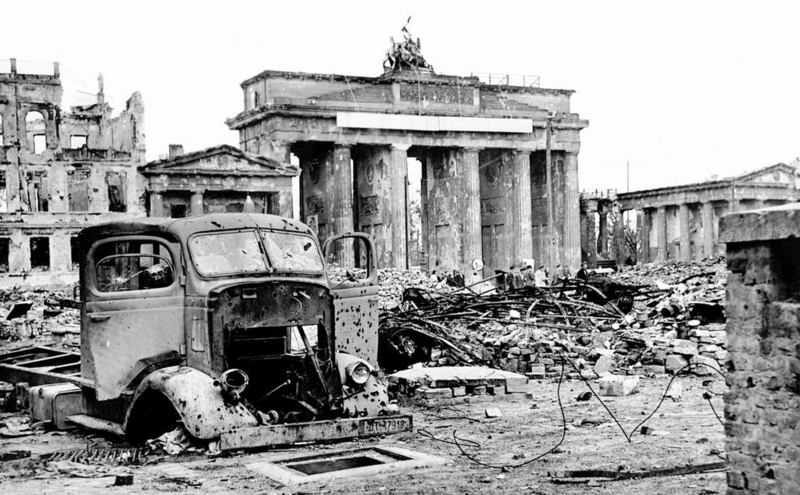 After the devastating fire, remains of the building and the dome were further demolished with horrific bombings of The Battle of Berlin, through World War II, and during Berlin’s fall to the Soviets in 1945. 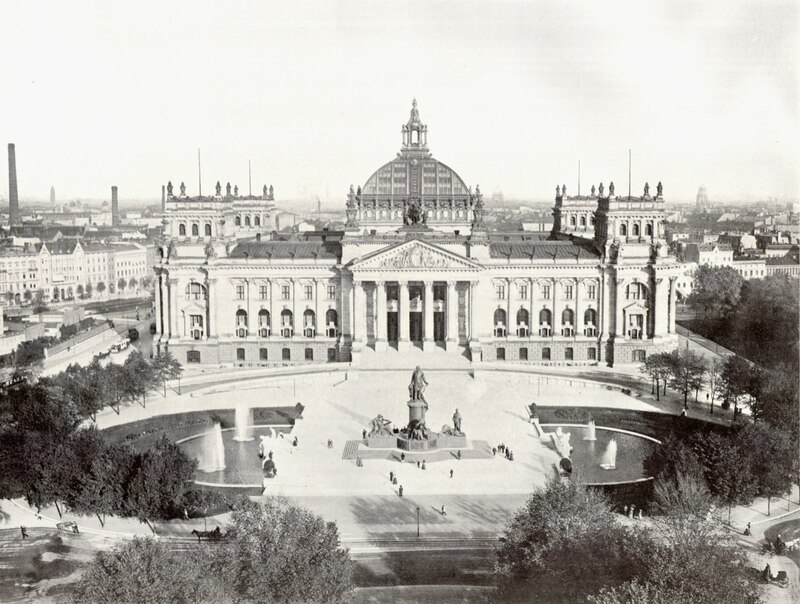 The original Reichstag building – minus the dome – was partly reconstructed in the 1960s and used as a conference center. Every day, people line up and wait for hours to visit the Reichstag. I decided to take a night tour, but it was a rainy evening so visibility wasn’t great. Touring the dome is a special experience! This entry was posted in Berlin, Germany and tagged 299 German Constituencies, Activist Marie Elisabeth Lüders, Berlin's Government District, Brandenburg Gate, British Architect Norman Foster, Charlemagne Holy Roman Emperor, Double Helix, Dr. Wolfgang Schäuble, Fall of Berlin to the Soviets in 1945, Federal Republic of Germany, German Bundestag, German Chancellor Angela Merkel, German Federal Assembly, German National Parliament, German Unification Treaty 1990, Habsburgs, Hitler Regime, Hitler's Nazi Regime, Marie-Elisabeth Lüders House, Medieval Habsburgs, Nazism, Personalized Proportional Representation, Plenary Chamber, Plenary Hall, Reichstag, Reichstag Building, Reichstag Fire, Reichstag Glass Dome, The Battle of Berlin, Weimar Republic, Wolfgang Schäuble President of the Federal Assembly and the German Bundestag by suemtravels. Bookmark the permalink.